Thought it was time to write on this again. 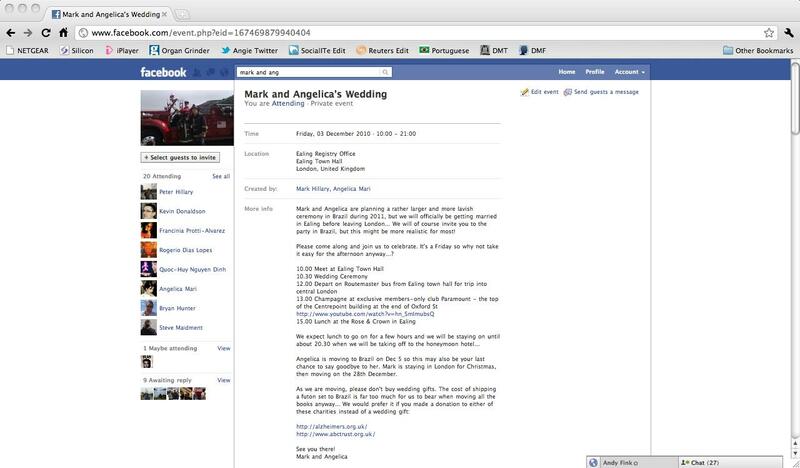 You see, a couple in Great Britain, Mark Hillary & Angelica Mari got married on December 3, 2010 and decided to forgo thee usual wedding etiquette like invitations, RSVP cards, save the date magnets, etc…. and only use social media. Not only did it save time, it saved loads of money on their wedding costs. Who wouldn’t want more money for the honeymoon instead of the wedding administration costs? Of course, what is the downside….. what if the marriage falls apart…. will everyone be notified the same way? Roy Cellan-Jones even covered this story and more on his blog at BBC. Here are some of the negative sides to social media on the back side. Should a new celebration be for a divorce, or a more ‘discrete’, private celebration for an affair, you and the others in your web will have a different perspective on how you and your life are presented to the world, who has access to it, what they can do with it. You might wish only snail mail existed. I know one or two people who deeply regret their Facebook history, because their lives and circumstances have changed and they wish that they could redefine their privacy, their friends, what the world knows about them. They can’t. They’ve tried. It’s to late. What are some more pros and cons of using social media for your wedding?